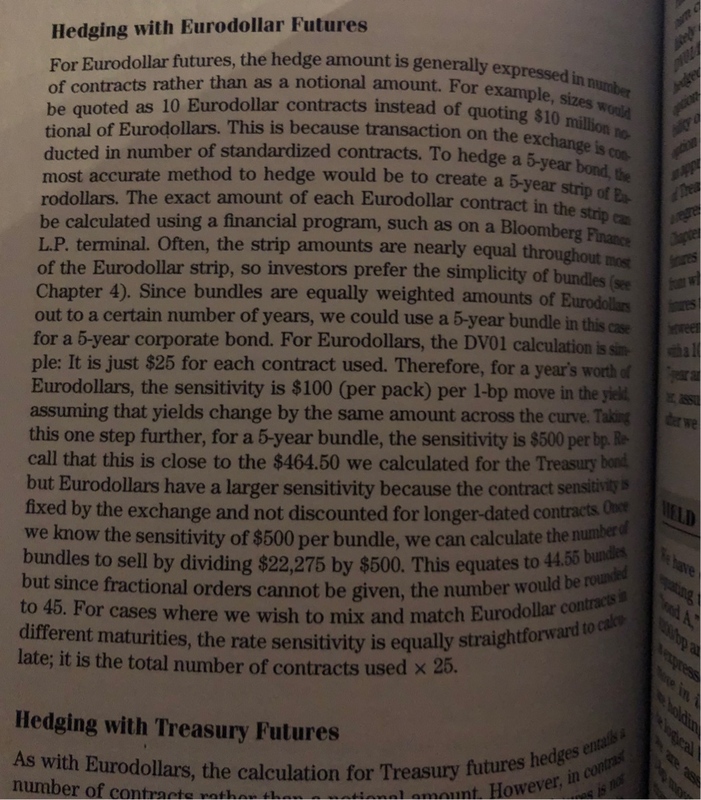 I was reading Interest Rates Markets by Jha, and on p. 214, he describes hedging a 5 year treasury bond with a ED future strip, as described below. He says the best hedging quantity can be generated with Bloomberg, but I am curious to know more about how to calculate this. I have seen this done with approximations and with bundles (as described below as an approximation), but I would like to understand the ideal methodology. Now look at the ED strip. Each 3-month contract has a pv01 of \$25 by definition of the instrument. If you purchase 1 each of every contract for 5y then you will have purchased 20 different contracts and your dv01 will be \$25 x 20 = \$500. How many times do you need to do this to hedge your \$4,500 exposure? 9. So buy 9 contracts of each individual contract going out 5y on the strip. Note a bundle is usually just an instrument that simulates buying different contracts at once. This book describes something that looks like DV01 hedging of the bond with eurodollar contracts. But the reality is that the underlying rates of the 2 kind of instruments are different. The bond depends on the treasury yield curve whereas the eurodollars depend on the Libor curve. These 2 curves share some common risk factors however there exist a basis between the 2. Therefore using simplistic hedge ratios based just on $DV01$ can be dangerous depending on what you are actually trading. For example if you were asked to provide a quote on a spread between the bond a a eurodollar strip that happens to be $DV01$ neutral you might work under the very wrong assumption that such a package is riskless. Not the answer you're looking for? Browse other questions tagged fixed-income hedging eurodollars or ask your own question.